Snapchat is very popular, but there are a lot of hidden features that many people do not know about. These hidden features can take your Snapchat game to the next level. In this post we will share with you our top 5 Snapchat Tricks. We hope you enjoy! If you’re interested in learning how to Hack Snapchat, we’ve got that covered with our Snapchat Hack. Tap and hold the screen. Swipe again while holding the screen with another finger to use a secondary filter! By default, Snapchat does not tell you when someone has unfriended you. However, there’s a clever workaround you can use to check if someone has removed you from their friend list. Simply look at their username. Next to their username it should display their Snapscore if they have you added as a friend. 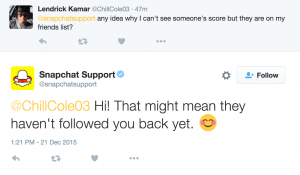 If they don’t have you added as a friend anymore, the Snapscore will disappear! A mostly unknown but nifty feature is that you can edit the way your friend’s name appears for you on Snapchat. 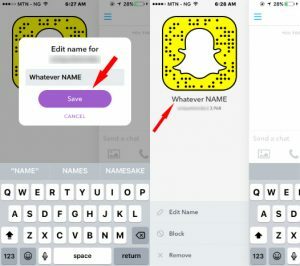 Note that this change is only visible for you, other people will still see their regular Snapchat name unless they also used this Snapchat Trick. Emoji’s are a lot of fun, but did you know that Snapchat allows you to draw with them?! 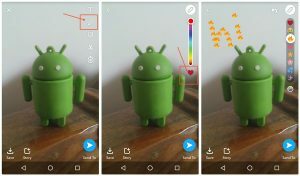 If you want to draw with emoji’s you can use this Snapchat Trick to do so. First select the pen drawing tool and then select the star emoji under the color bar. Almost everybody knows that there are selfie filters for Snapchat which were added a while ago. What a lot of people don’t know is that there are also lenses and filters for your rear facing camera! They’re called world lenses and are a lot of fun to play around with. Check them out the next time you’re taking a picture with your rear camera. That concludes our top 5 Snapchat tricks for today. If you have any other Snapchat Tricks you wish to share, don’t hestitate to leave a comment and maybe we’ll include them in our next installment of Snapchat Tricks!